Natasha Pacheco and Abby Pesansky (#55) put the squeeze on Fairfax's Ally Johnson in the first half of the Cavs' win. On Monday night at Fairfax, the Woodson Cavaliers simply did the dirty work to get things done. They out-muscled a smaller Fairfax team on the glass, out-rebounding the Rebels by an almost two-to-one margin. They dove and hustled for loose balls. Most importantly, they played good defense en route to a 43-34 Patriot District Tournament first round win. The old adage is that defense wins championships. For the Cavaliers, who have scored 50 points only four times this year, it is a necessity just to compete. Woodson sophomore Anna Wiggins hustles for the loose ball in Monday’s victory. In a game the Cavaliers had to have to continue their season in next week’s regional tournament, they came out ready to fight from the opening bell. They took a quick 6-0 lead and extended it to 9-2 on a three-pointer by freshman guard Eunice Yoon with about three minutes left in the quarter. 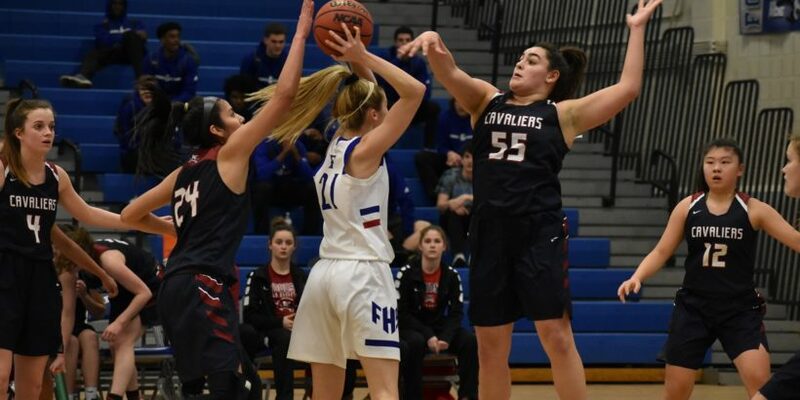 Rebounding was the key as the Cavaliers got a number of second chances on offense, out-rebounding Fairfax 12-4 in the quarter. Then points became hard to come by both ways. 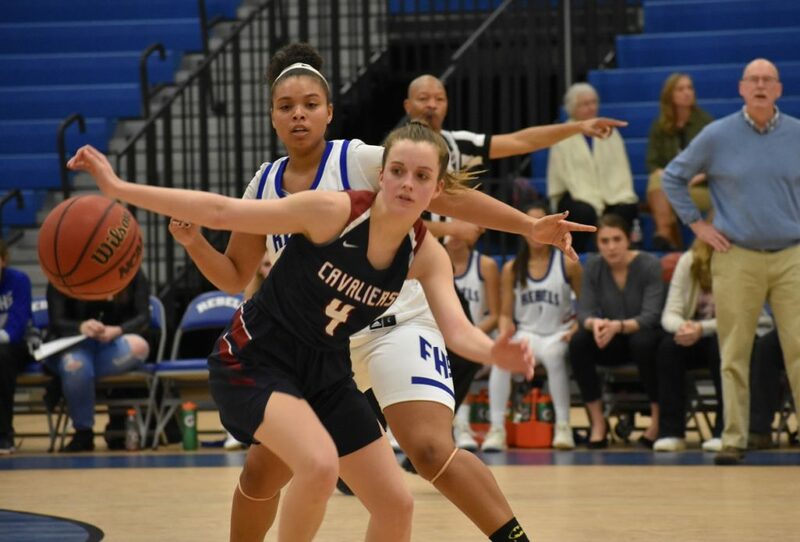 Fairfax got a little traction against Woodson’s 2-3 zone with junior guard Meredith Moore, who scored five first quarter points off the bench to cut the Cavs lead to 11-7 at the end of one. Fellow junior guard Sam McNaughton then got untracked a little and at halftime Woodson’s lead was down to 16-15. The third quarter is where Woodson essentially won the game. Its zone got even better with long-armed Natasha Pacheco and Sarah Wilson up top. Plus the Cavaliers started to score. Yoon drained another three to make it 26-19. Then Wilson drained one a few minutes later to make it 29-19. A 13-4 run may not seem like much, but in a game like this it was. It forced Fairfax coach Pat Deegan to take his third time out of the quarter. Woodson didn’t score again the rest of third quarter, but its defense still gave Fairfax trouble. 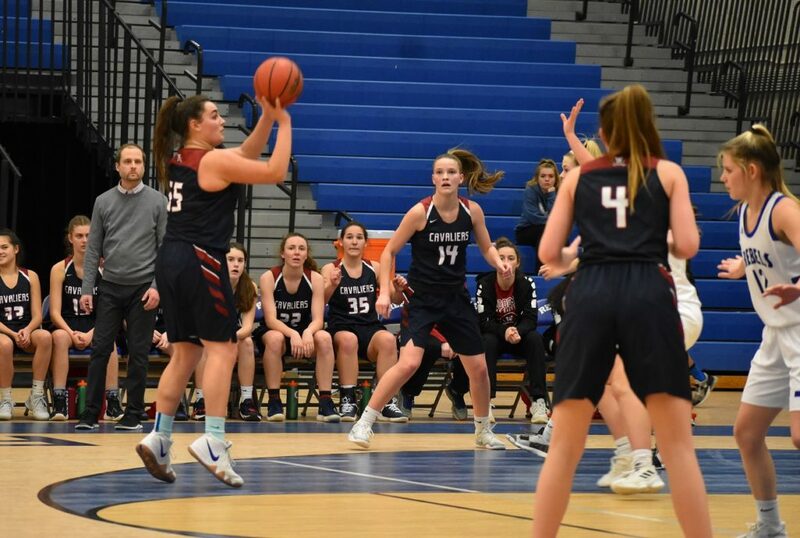 McNaughton and fellow dynamic guard Melanie George did manage to get things going a little in the fourth quarter, pushing the ball in transition and getting to the line, but it just wasn’t enough. Fairfax shot only 25% from the field as a whole, not enough to come back from a double-digit lead. Abby Pesansky drains a key bucket in the second half. The Rebels (10-11) were led by George, who finished with 15 points and seven rebounds. McNaughton added eight points. 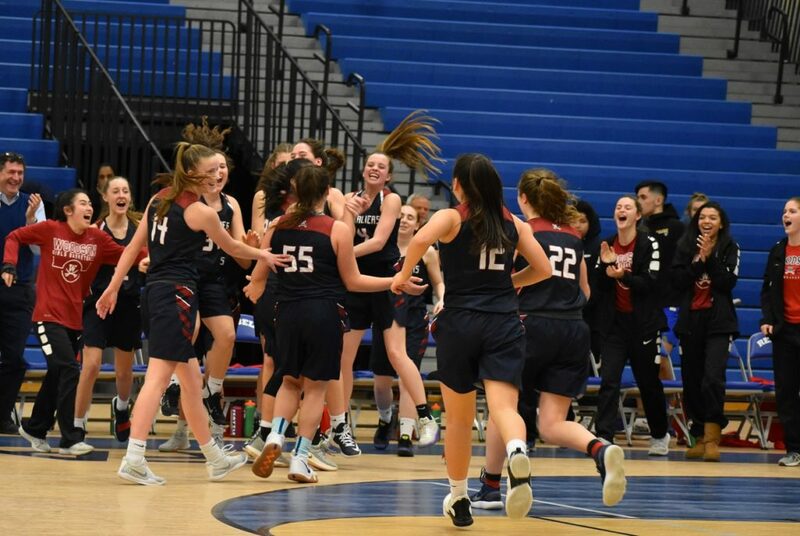 It was a bitter end to the season for third-seeded Fairfax, but the dynamic pair of McNaughton and George both return next year and the Rebels figure to again field a strong team. Junior center Abby Pesansky was key for the Cavaliers. She had 14 points and 11 rebounds on the evening and consistently kept Fairfax from scoring in the paint. Junior forward Maggie McGuire had 10 rebounds, with her and Pesansky alone out-rebounding the entire Rebels team. Yoon added nine points and Pacheco added eight. Wilson had a fantastic game off the bench with her defense, and she added four assists on the offensive end. Woodson (13-10) has had an up-and-down season. They started hot and were ranked as one of the better teams in the area in our Nova Nineteen rankings, but had some injuries and finished last in the brutal Patriot District regular season. None of that matters now for the Cavs, who advance to face Lake Braddock in tomorrow’s Patriot District semi-final. Woodson players celebrate after the important victory.